Blue is a village smithy and economy house built in 1824, which was lovingly renovated in style. This resulted in 2 Exlusive apartment. The high-quality parquet and the earthy tones in the living area provide well-being, peace and serenity in our otherwise impulsive life. A special accent in the living room is a spiral staircase to the gallery bedroom in front of a structure plaster wall in earth tone color. 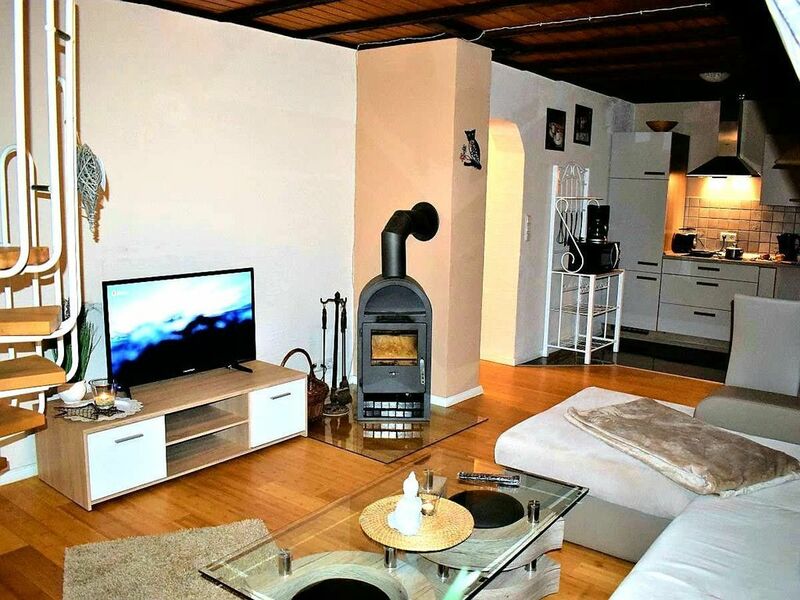 The radiant heat of the stove seduces in the cold season for cozy evenings on the cozy Federkerncouch. The interior decoration in bog oak combined with sand-tone and oriental decoration give time of relaxation. The spacious double bedroom is equipped with a high-quality box spring bed and a sliding door cabinet made of bog oak in contrast to the warm earth tones, so that in addition to a chair enough space for an existing travel cot remains. The village of about 230 souls lies at the foot of the mountain "Alterfoss" (599m) with lookout point at the "Liberation Book" A stream that makes its way through the harmonic place leads past the leisure park Eifel Adventures and leaves the valley through a deep Gorge full of natural heritage of millions of years. Signposted hiking trails lead through and around the village. In the village, Gisela Görgen offers on appointment massage & spa treatments in your rooms but also as a home visit, so that you are "from head to toe in good hands". Berlingen is an approximately 200 soul town which is becoming increasingly popular in tourism.